craft distillers by offering low cost bung options. For being a distillery in downtown Fort Wayne, Three Rivers Distilling Co. has many ties to the Wells County community. Three Rivers started producing spirits in 2016, which include vodka, rum, whiskey, bourbon, gin and a coffee liquer. The distillery opened its taproom in February, which includes a restaurant and tasting room as well as a large patio, on which live music is frequently hosted. As part of a recent change, all of the grain that is used by the distillery to make its spirits comes from Harvest Grains, a co-op in Bluffton. 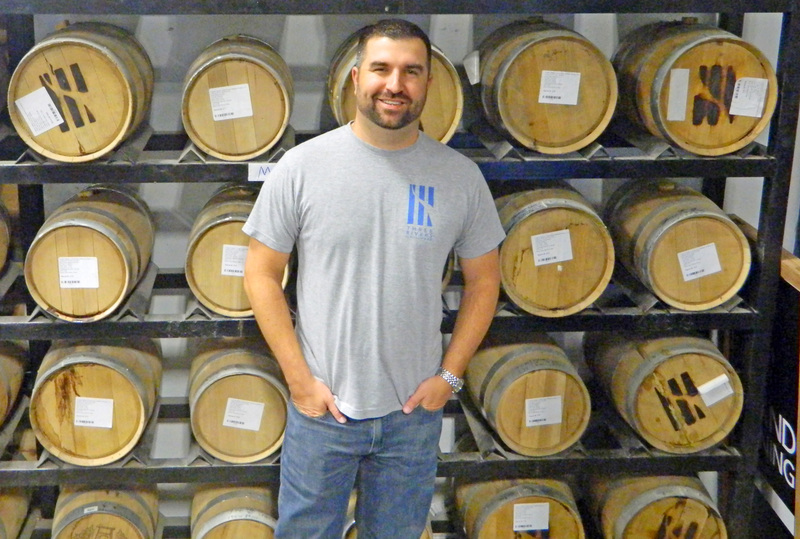 Aaron Pence, co-owner of the distillery, said they previously bought all of their grain from a place in Lebanon but made the switch after realizing the grain from Bluffton was simply of a higher quality. Lower quality grain can compromise the flavor of the spirits, Pence said. The distillery, located at 224 E. Wallace St., Fort Wayne, distributes spirits to 250 locations, most of which are in Indiana. However, the distillery has branched into Kentucky and Illinois as well. Pence himself is another Wells County connection. Pence grew up in an area of west of Indianapolis, but he was born in Bluffton and remembers Ossian from his childhood. His grandmother, the late Shirley Pence, worked at Heyerly Bakery for 25 years. “I have always had fond memories of spending time with Grandma in Ossian,” he said. Those memories helped make his decision to buy a house in Ossian after he married his wife Kelly, who is originally from Berne. They now live there with their two daughters, Charleigh and Hayden. He is not one of the founding owners of the distillery, but he came on board after hearing about the opportunity through fellow veterans who owned the establishment. Pence still serves in the 122nd Fighter Wing of the Indiana National Guard, as he has for 15 years. He has served as an aircraft officer, and he will begin a new position as public affairs officer in the fall. “I thought I would be full time in the military forever,” he said. As part of what he calls a natural career progression, Pence ended up working for Stryker Industries, a small business that works toward building a manufacturing network to bid on military missile contracts. “I was playing around with test missiles, and I changed from that to bourbon,” he said. The military experience has given the distillery an edge from the beginning. Pence said the business doesn’t necessarily seek out veterans to work at the distillery, but because of their own networks, the distillery has quite the military presence. However, Pence said he likes to hire veterans, because he already knows they have a strong work ethic and will be loyal if treated as valuable employees. Some of the staff have past engineering experience through the military that allowed them to build their own custom equipment for distilling each spirit, which saved a lot of money up front for starting up the business. Three Rivers has four different sets of equipment for making their spirits, each of which pulls the sugar from the grain and distills it into alcohol. Once the grain is spent, it is given to a farmer in Markle, because the spent grain can still be used to feed livestock. To add to the list of Wells County connections, 2010 Norwell High School graduate Ryan Ellis was recently hired as the tasting room’s craft mixologist to run the bar. Whiskeys and bourbon are aged in barrels. Each barrel has a stopper, which is called a bung. All of the distillery’s bungs are bought from J & R Products in Bluffton. Pence said the distillery is proud to support local farms and businesses.